Timber! 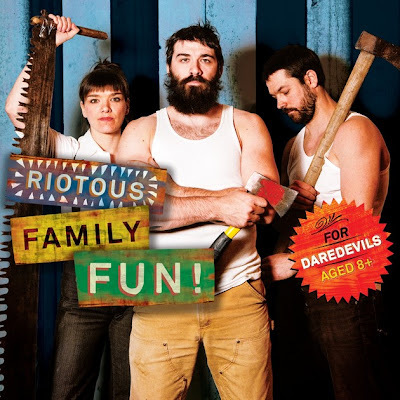 by Cirque Alfonse is the first of Southbank Centre’s two big summer shows and runs from 10th – 31st July. It’s the UK premier of Timer! and the UK debut of Cirque Alfonse. Timber! is a daredevil, heart-warming show steeped in the folklore, traditions and aesthetics of Québec’s lumberjack, logging and farming heritage. Timber! is definitely a different kind of show, I have never seen any show like it. With so many different displays of talent it’s hard to pin point what was so good. 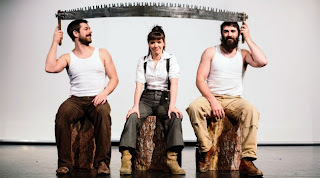 The setting of the show is set in a lumber-camp, the stage is very impressive, the whole cast remain on the stage throughout the whole performance as well as the live band, it is a great atmosphere. The show itself does start off quite slowly, it takes them a while to get in to their stride. With the first act being a display of high speed vegetable chopping you aren't really sure what you've let yourself in for. As the show develops you get to see some amazing displays of strength and skill. With axe throwing, clog dancing, dare-devil acrobatics, banjo and fiddle playing and the scariest act I have ever seen done with a saw (I couldn't even look at some points). With a father, a son, a daughter, her partner and a two year old son it is a family affair, you can tell that the whole cast are extremely close and with some of the acts that they are doing this vital. We even got to meet the two year old little boy, who stole the show at the end with his little bow, the most adorable thing I have ever seen. All in all, once the show got in to the swing of things, it was great. It’s good to see something different, something unique and be extremely impressed. It is a show for all ages, with adults and kids enjoying the whole show and all round family show.